Harry came through the youth system with Shrewsbury Town, signing his first professional contract in early 2014, before being snapped up by Premiership side Southampton in August 2015. Having already received international recognition at both under-16 and under-18 level for England, he appeared regularly for Southampton's under-18 and under-21 sides over the next two seasons. He made his professional debut in an FA Cup 2-2 draw against Norwich City in January 2017, also playing in the replay victory and against Arsenal in the next round. 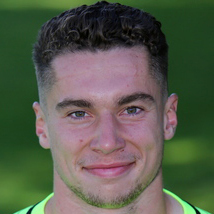 Having signed a new three year deal at St Mary's in July 2017, the highly-rated young keeper joined United for a one year loan spell. Harry was born on this date in Shrewsbury, England.